I have always been fascinated with the question “What if?”. It is such a stimulating, mind-exercising question that it actually helps unravel the mysteries of our own very reality, as to why things may have happened the way they did, and ultimately leading us to understand the wider world as well as our own internal universe that is the Self. I am in fact planning to write a separate article series on the phenomenon of alternate realities with its scientific background and the philosophical implications and Phillip Ball’s piece in Nautilus is a good opening dialogue for this so I wanted to share it. (Nautil.us site, Dec.15,2016, Illustrations by J.Ferrent). He is right that imagining alternative routes to discovery can help to puncture myths. It is also a fact that sometimes discoveries or breakthrough ideas occur to different individuals more or less simultaneously. “What would physics look like if Einstein had never existed, or biology without Darwin? In one view, nothing much would change—the discoveries they made and theories they devised would have materialized anyway sooner or later. 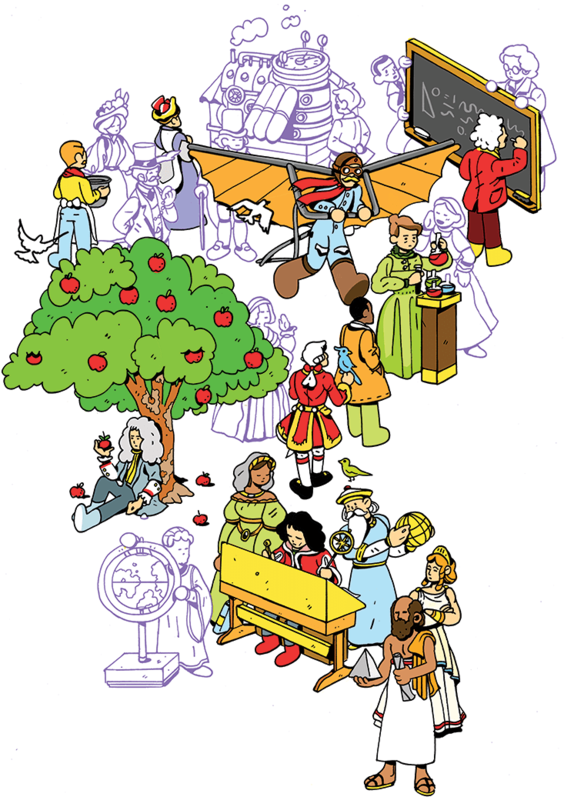 That’s the odd thing about heroes and heroines of science: They are revered, they get institutions and quantities and even chemical elements named after them, and yet they are also regarded as somewhat expendable and replaceable in the onward march of scientific understanding. For one thing, the most obvious candidate to replace one genius seems to be another genius. No surprise, maybe, but it makes you wonder whether the much-derided “great man” view of history, which ascribes historical trajectories to the actions and decisions of individuals, might not have some validity in science. You might wonder whether there’s some selection effect here: We overlook lesser-known candidates precisely because they weren’t discoverers, even though they could have been. But it seems entirely possible that, on the contrary, greatness always emerges, if not in one direction then another. I say “great man” intentionally, because for all but the most recent (1953) of the cases selected here I could see no plausible female candidate. That’s mostly a consequence of the almost total exclusion of women from science at least until the early 20th century; even if we looked for an alternative to Marie Curie, it would probably have to be a man. But the statistics of scientific Nobel Prizes suggests that we’re not doing much better at inclusion even now. This under-use of the intelligence and creativity of half of humankind is idiotic and shameful, and highlighting the shortfall in an exercise like this is another argument for its value. There are few great discoveries for which one can’t find precedents, and heliocentrism—the idea that the Earth revolves around the sun and not vice versa—is no exception. It’s such a pivotal concept in the history of science, displacing humanity from the center of what was then considered the universe, that anticipations have been well documented before the German-Polish astronomer Nicolaus Copernicus outlined the theory in his epochal De revolutionibus orbium coelestium, published as he lay on his deathbed in 1543. The Greek mathematician Aristarchus of Samos proposed a scheme like this in the third century B.C., for instance, and in the mid-15th century A.D. the German cardinal Nicholas of Cusa asked if there was a definitive center of the universe at all. What made Copernican theory different was that it was based on a mathematical argument that took careful account of the known movements of the planets. Copernicus nearly didn’t disclose his ideas at all. It was a young Austrian professor named Georg Rheticus who persuaded him to publish the book, and only just in time. So there’s more reason than ever to wonder, had Copernicus died too soon, who else would have reached the same conclusion. Other 16th-century astronomers, such as the Germans Erasmus Reinhold and Christopher Clavius, had Copernicus’s mathematical turn of mind and observational acumen, but both were ideologically wedded to geocentrism (an Earth-centered universe). 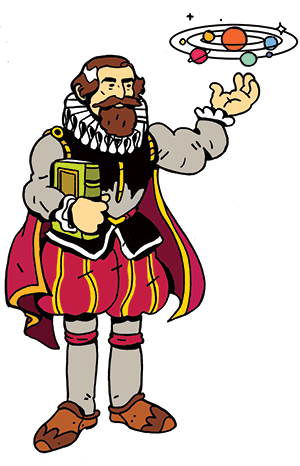 The Dane Tycho Brahe, working in Prague, shook things up in the 1570s with a geocentric model in which the sun orbited the Earth but the other planets orbited the sun. But I think the leap to heliocentrism would not otherwise have happened until the early 17th century. We know that Galileo got into trouble for promoting the Copernican theory a little too aggressively for the taste of the Catholic Church in Rome—and he was iconoclastic and skillful enough to have had the idea himself. But I suspect that Tycho’s protégé and Galileo’s correspondent, the German Johannes Kepler, would have done it first. He had access to Tycho’s excellent observational data, he was mathematically adept, but crucially he also had Copernicus’s dash of (to our eyes) mysticism that saw a sun-centered universe as appropriately harmonious. To dare to put the sun in the middle, you needed not just rational but also aesthetic motives, and that was Kepler all over. It’s easy to get the impression that Isaac Newton was thinking on a different plane from his contemporaries in the late 17th century. While Robert Boyle, one of the most illustrious luminaries of the Royal Society, was a master experimentalist who hesitated to frame hypotheses about his observations, and Newton’s bitter rival Robert Hooke was a genius at instrumentation but tended to confuse a promising thought with a thorough explanation, Newton seemed able to make the abstract leap from close observation to underlying principles. Most famously and impressively, he transformed astronomy from a theory of how the heavenly bodies moved to an account of why they do so: A single law of gravitational attraction was all you needed to explain the shapes of planetary and lunar orbits and the trajectories of comets. All this was laid out in Newton’s Principia, published in 1687 after being instigated to eclipse Hooke’s reckless claim that he could explain the ellipse-shaped planetary orbits. Before he could deal with planets, Newton had to set down his basic laws of motion. The three that he described in Book I are the foundation of classical mechanics. In short: Bodies maintain their state of uniform motion or rest unless forces act on them; force equals mass times acceleration; and for every action there is an equal and opposite reaction. They are concise, complete, and simply stated, almost heart-breaking in their elegance. Could anyone else have managed that feat in Newton’s day? in optics and probability. He was especially good at devising clocks and watches, which occasioned a priority dispute with the irascible Hooke. Huygens’ theorems on mechanics in his book on the pendulum clock in 1673 were taken as a model by Newton for the Principia. Newton’s first law was scarcely his anyway: Known also as the law of inertia (a moving object keeps moving in the absence of a force), it was essentially stated by Galileo, and Huygens embraced it too. The Dutchman’s studies of collisions hover on the brink of stating the third law, while Huygens actually wrote down a version of the second law independently. He had what it took to initiate what we now call Newtonian mechanics. One reason why it is more than just fun to imagine alternative routes to discovery is that it can help to puncture myths. The story of Einstein imagining his way to special relativity in 1905 by conceptually riding on a light beam captures his playful inventiveness but gives us little sense of his real motives. Nor were they, as often suggested, to explain why the experiments of Albert Michelson and Edward Morley in the 1880s had failed to detect the putative light-bearing ether. Einstein was inconsistent about the role of those experiments in his thinking, but it clearly wasn’t a big one. No, the reason special relativity was needed was that the equations devised by the Scottish scientist James Clerk Maxwell in the 1860s to account for the unity of electric and magnetic phenomena predict the speed of light. Speeds are usually contingent things—the speed of sound, for instance, depends on the medium it travels through. But if the laws of physics, such as Maxwell’s equations of electromagnetism, stay the same regardless of how fast your frame of reference is (steadily) moving, then the speed of light shouldn’t depend on relative motion. Einstein’s theory of special relativity took that as a basic postulate and asked what followed: namely, that space contracts and time slows for objects in motion. In 1916 Einstein unveiled a new view of gravity, which superseded the theory of Isaac Newton that had reigned for over two centuries. He argued that the force we call gravity arises from the curvature of space and time (the four-dimensional fabric called spacetime) in the presence of mass. This curvature causes the acceleration of bodies in a gravitational field: the steady speeding up of an object falling to Earth from a great height, say. This was the theory of general relativity, which is still the best theory of gravitation that exists today and explains the orbits of the planets, the collapse of stars into black holes, and the expansion of the universe. It is Einstein’s most remarkable and revered work. Permit me again to bend the rules of the game here—for once more, Einstein might have been beaten to it if another scientist had not died first. That person was Hermann Minkowski, a German mathematician under whom Einstein had studied in Zurich. Much of Minkowski’s work was in pure mathematics, but he also worked on problems related to physics. In 1908 Minkowski explained that the proper way to understand Einstein’s theory of special relativity—which was all about bodies moving at constant speeds, not accelerating—was in terms of a four-dimensional spacetime. Einstein was at first skeptical, but he later drew on the concept to formulate general relativity. Minkowski was already alert to the implications, however. Crucially, he saw that whereas the path of an object moving at a constant speed in spacetime is a straight line, that of an accelerating object is curved. In three-dimensional space, the path of the moon orbiting the earth under the influence of their gravitational attraction is more or less circular. But the four-dimensional worldline of the orbiting moon is a kind of helix: It goes round and round in space, but returns to the same position in space at a different time. There’s more to general relativity than that. It is mass itself, Einstein said, that deforms spacetime into this curving, so-called non-Euclidean (not flat) shape. But the idea of a non-Euclidean spacetime was Minkowski’s, and it’s quite conceivable that he would have fleshed out the idea into a full-blown gravitational theory, perhaps working together with the formidable mathematician David Hilbert at the University of Göttingen, where Minkowski was based starting from 1902. We do know, from a lecture Minkowski gave at Göttingen in 1907, that he was already thinking about gravitation in the context of relativity and spacetime. But we’ll never know how far he would have taken that, had he not died suddenly at the start of 1909, aged just 44. The expert on this “blackbody radiation” was Wilhelm Wien, who won a Nobel Prize for his work. Wien came within a whisker of other important discoveries too: In 1900 he decided that E = 3/4mc2(spot the problem? ), and he first saw protons in 1898 but didn’t know what he had discovered. Yet I think Wien was too much a traditionalist to have risked Planck’s quanta. No—I think that, were it not for Planck’s work on blackbody radiation, quantization of energy would have been deduced from another direction. Because of this quantization, atoms absorb and emit light only at very specific frequencies, for which the light quanta have just the right amount of energy to enable an electron orbiting the atom to jump from one quantized energy state to another. It is because electrons in atoms can only adopt these discrete energy states and not ones in between that atoms are stable at all, the electrons being unable (as classical physics would predict) to gradually lose energy and spiral into the electrically positive nucleus. So as the theory of the internal structure of atoms evolved in the early 20th century, sooner or later quantization would have been an unavoidable inference. But who would have inferred it? Ernest Rutherford was the expert on atomic structure, but too much the experimentalist and temperamentally resistant to wild speculation. The Dane Niels Bohr was the first to suggest the quantum view of the atom, but only because he had Planck and Einstein’s work on energy quanta to draw on. I can’t help wondering if the English physicist J. J. Thomson, who discovered electrons themselves and under whom both Rutherford and Bohr worked for a time, might have suspected it. He was an expert on atomic theory, the mentor of Charles Glover Barkla who studied quantum jumps in atoms due to X-ray emission, and lived until 1940. He would have been well placed to give quantum theory a less timid origin. 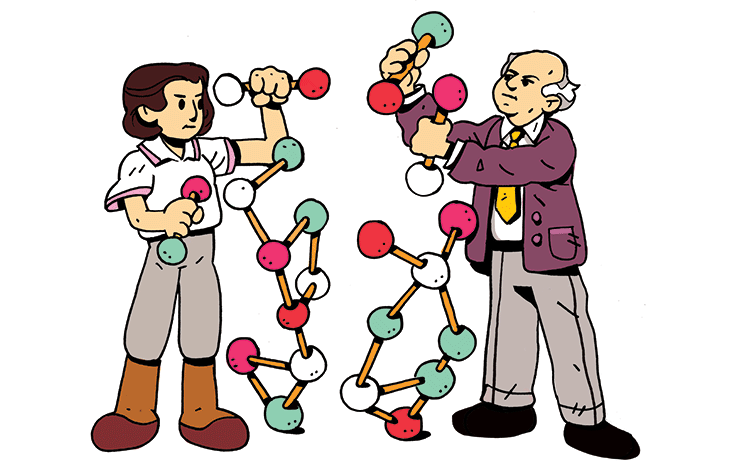 I’d love to think that Rosalind Franklin, the English crystallographer whose data were central to the discovery of the double-helical structure of DNA, would have figured it out if James Watson and Francis Crick hadn’t done so first in 1953. It was famously only when Watson saw the pattern of X-rays scattered from DNA and recorded by Franklin and student Raymond Gosling that he became convinced about the double helix. He was shown these data by Maurice Wilkins, with whom Franklin had a prickly working relationship at King’s College London—and Wilkins did not have Franklin’s permission for that, although any impropriety has been overplayed in accounts that make Franklin the wronged heroine. In any event, those data triggered Watson and Crick’s deduction that DNA is a helix of two strands zipped together via weak chemical bonds between the gene-encoding bases spaced regularly along the backbones. The urge to award the “alternative discovery” to Franklin is heightened by the ungallant, indeed frankly misogynistic, treatment she got from Watson in his racy but somewhat unreliable 1968 memoir of the discovery, The Double Helix. Watson is rightly haunted now by his chauvinistic attitude. I was worried, though, that Franklin—cautious, careful and conservative by instinct in contrast to the brilliant, intuitive Crick and the brash young Watson—wouldn’t have stuck her neck out on the basis of what by today’s standards is rather flimsy evidence. She knew that a female scientist in those days couldn’t afford to make mistakes. So I was delighted when Matthew Cobb, a zoologist at the University of Manchester who delved deeply into the DNA story for his 2015 book Life’s Greatest Secret, confidently told me that, yes, Franklin would have done it. “The progress she made on her own, increasingly isolated and without the benefit of anyone to exchange ideas with, was simply remarkable,” Cobb wrote in The Guardian. Just weeks before Watson and Crick invited Franklin and Wilkins to see their model of DNA in March 1953, Franklin’s notebooks—studied in detail by British biochemist Aaron Klug, who won a Nobel Prize for his own work on DNA—show that she had realized DNA has a double-helix structure and that the two strands have complementary chemical structures, enabling one to act as a template for replication of the other in the way Watson and Crick famously alluded to in their discovery paper in Nature that April. “Crick and I have discussed this several times,” wrote Klug in the Journal of Molecular Biology. “We agree she would have solved the structure, but the results would have come out gradually, not as a thunderbolt, in a short paper in Nature.” At any rate, her contributions to the discovery are undeniable. “It is clear that, had Franklin lived, the Nobel Prize committee ought to have awarded her a Nobel Prize, too,” writes Cobb. The other contender for the discovery is American chemist Linus Pauling, who was the Cambridge duo’s most feared rival. Pauling had impetuously proposed a triple-helical structure of DNA in early 1953 with the backbones on the inside and the bases facing out. It made no chemical sense, as Watson and Crick quickly appreciated to their great relief. Unperturbed by such gaffes, Pauling would have bounced back. But he didn’t have Franklin’s X-ray data. “Pauling was a man with great insight, but not a magician who could manage without data,” wrote Klug. Sometimes discoveries or breakthrough ideas occur to different individuals more or less simultaneously. It happened with calculus (Leibniz and Newton), with the chemical element oxygen (Scheele, Priestley, and Lavoisier), and most famously, with evolution by natural selection, announced in 1858 by Charles Darwin and Alfred Russel Wallace. It’s tempting to suppose that at such moments there was “something in the air”: that the time for discovery was ripe and it would inevitably have occurred to someone sooner or later. If that’s so, it shouldn’t be too hard to identify other candidate discoverers. If we expunge both Darwin and Wallace from the picture, who could fill their shoes? Well, here’s the thing. Darwin had plenty of advocates after he published On the Origin of Species, but I struggle to see how any of them would have deduced the theory by themselves. As for Wallace, his evolutionary theory was not at all identical to Darwin’s anyway, despite what Darwin himself said: as his biographers Adrian Desmond and James Moore say, in part he “read his own thought” into Wallace’s account. I wondered if my floundering for candidates just betrayed my own ignorance or lack of imagination. So I asked historian and philosopher of science James Lennox of the University of Pittsburgh, an expert on the history of Darwinian theory, who might have done the job in place of Darwin and Wallace. His answer was striking: The story might not have gone that way at all. They survived revolution, war and the cold. Now restored works from a legendary Moscow collection are going on show. This summer, as 130 works from the collection head to Paris for an exhibition at the Louis Vuitton Foundation in October, Russian and French art experts see it as a triumph of art over the century-long onslaught of war and revolution. “Considering what they have been through, the paintings are in good condition,” says Anne Baldassari, the exhibition’s curator. The Soviet authorities considered the works bourgeois and not ideologically correct, so they were banned for a long period from being shown in public. It would be half a century before Shchukin’s achievements as a pioneering collector were acknowledged. The question of how life got its start on Earth is a tricky one. Life as we know it needs a genetic mechanism like DNA or RNA to record blueprints for proteins, but proteins are required for the replication of DNA in the first place — and none of that is likely to happen without a cell membrane made of lipids to keep unwanted chemicals out. Biologists have argued for years over which of these three systems might have emerged first, but new research suggests a radical solution to the chicken-and-the-egg conundrum: All three developed at once. John Sutherland and his team at the University of Cambridge show in a paper published this week in Nature Chemistry that all the elements and energy to create the three systems would have been present in the primordial soup of early Earth. The research shows how the common compounds hydrogen sulfide and hydrogen cyanide, in a bath of UV light and water, could morph into dozens of nucleic acids and lipids. With all the building blocks formed simultaneously, the rest of the process was free to take place. Perhaps the one prominent theory discounted by Sutherland’s work is exogenesis, the idea that life may have been brought to Earth by a meteor or other celestial object. But even that gets a nod: Meteoric bombardment would have helped supply hydrogen cyanide, iron and other essential elements. Find repose by exciting the mind. Some of the world’s leading thinkers offer the books that inspired them and their work. Skim the list for your favorite speakers, or get nerdy on a topic you’ve always wanted to know more about. Below find 52 books, recommended by TED speakers. Trees can talk to and help each other using an internet of fungus! Trees can talk to and help each other using an internet of fungi! It’s not like we are connected in a new-agey oohm-y way, but science backs up the ınterconnectivity among living beings. And for me, that is great enough.